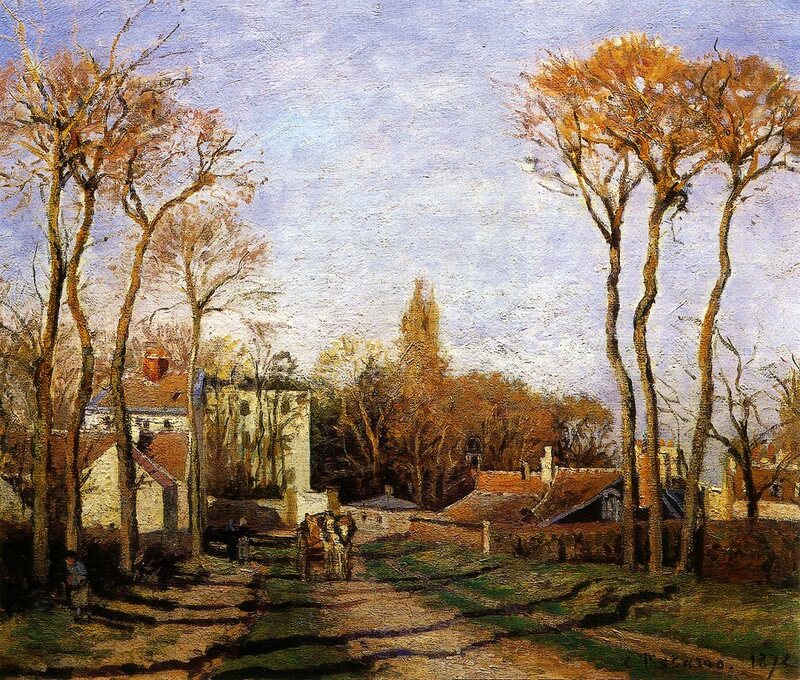 Between 1869 and 1872, except for the interruption of war, Pissarro lived in Louveciennes. Nearby is the village of Voisins, shown here, where Sisley later lived. This is characteristic of many of Pissarro's paintings in that its composition is divided and structured by the central road. The viewpoint is such that over half of the work is covered by the luminous area of sky. Compared to earlier works by Pissarro it shows the influence of Monet in the bright palette and light brushstrokes. There is a strong, almost symmetrical, organization to the work, which is underpinned by the two groups of trees either side of the road and the long shadows cast by those on the left. The taller complex of buildings tempers the otherwise rather rigid symmetry, while the horse and wagon dawdling along the road and the scattered figures enhance the serenity of the painting. The result is an unassuming image typical of the artist's works of this period. It owes much to the paintings of Corot, who had advised Pissarro in the 1850s and indeed in composition and spirit it is similar to Corot's Church of Marissel. Pissarro was one of the few Impressionists to favor such rustic scenes in preference to those of city life and leisure.